In year 1999 European Flying Disc Federation (EFDF) held a project “Flying Disc Sports in Baltic Region”. In Zarasai, Lithuania “Ąžuolas” gymnasium passed the very first seminar led by P. Erikson and A. Backman. They presented games related to flying disc and the first person who became very interested in it was a sports teacher from Zarasai “Ąžuolas” gymnasium Andrius Navickas. By May 2001 first promo tournament was held in Zarasai island beach. First competitors were teams from around the district. After the Stockholm seminar in August teachers E. Medzevičienė, V. Jonas and A. Navickas started organizing tournaments and in September the first official tournament in Vilnius “Kalnų” park became reality. Competing teams: M. Valančius art gymnasium, A. Vienuolis gymnasium, Zarasai “Ąžuolas” gymnasium and a team from Latvia. 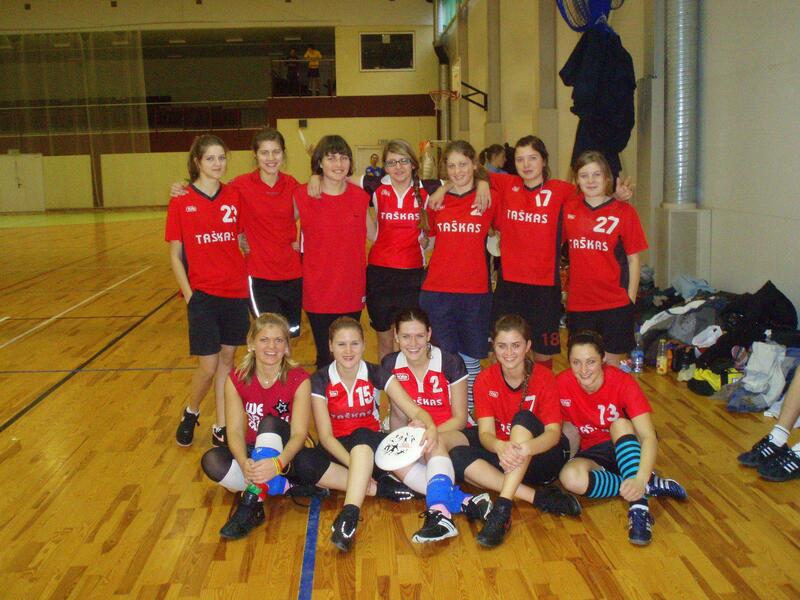 The winners of the first tournament in Lithuania were Zarasai “Ąžuolas” gymnasium. 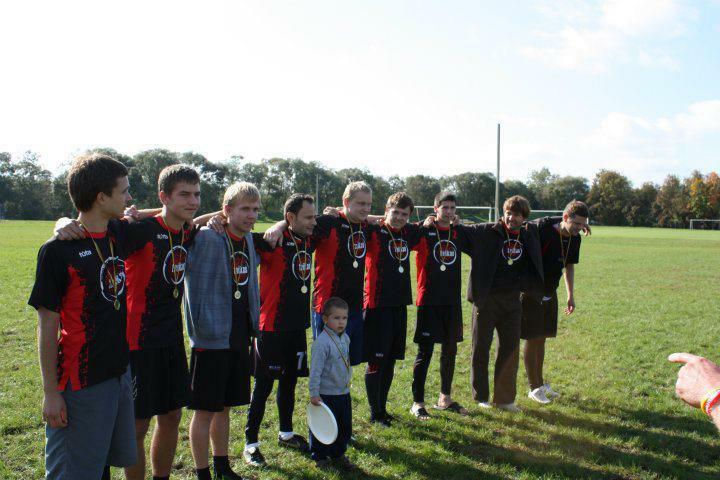 On the 16th of October, 2001 the first flying disc club in Lithuania “Taškas” was created and started to grow. 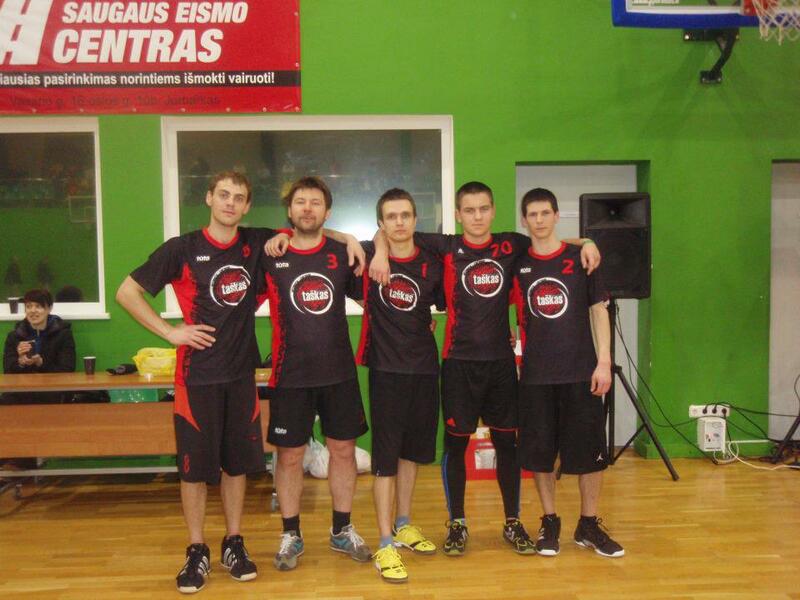 A month later “Taškas” took part in “Rigas Rudens” tournament in Riga, Latvia. The freshly made team managed to finish 9th out of 12 teams participated in the tournament. 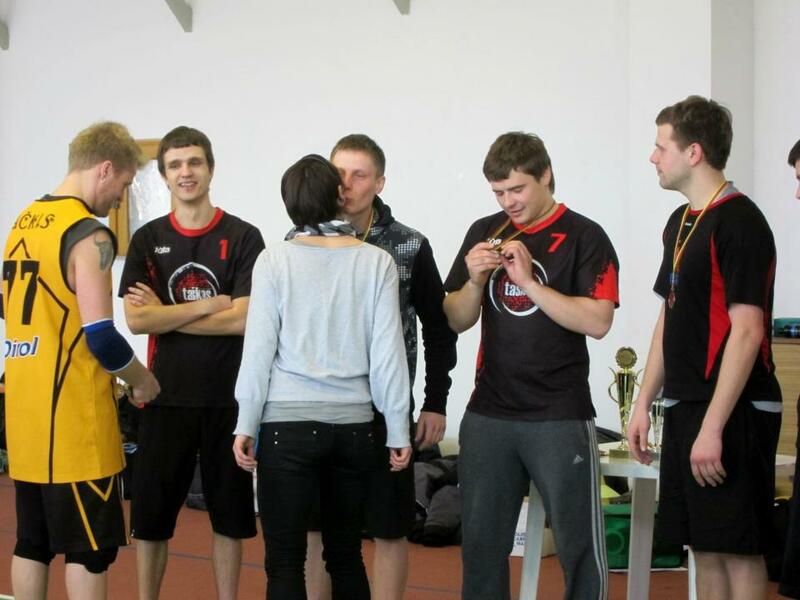 In February 2002 the team made a decision to take part in “Lord Novgorod” tournament in Velikij Novgorod, Russia. Along with another team from Lithuania – “Vorai” (Trakų Vokė): 9th place for “Taškas” and 8th for “Vorai”. In July A. Navickas and K. Bačkis organized a training camp for the Lithuania open junior team to prepare for the World Ultimate Junior Championships in Riga, Latvia. After the WUJC more and more people joined the team and Taškas became the dominating team in Lithuania and around Baltic states. In August 2004 World Ultimate and Guts Championships took place in Turku, Finland. For the first time in Lithuanian ultimate history the national open team had an opportunity to play against the strongest teams in the world. Six Taškas’ members were invited to the team and Lithuania finished 15th out of 18 teams that participated in the tournament. In April 2005 the club decided to host the first international outdoor tournament “Zaraza”. Guests came along from around Latvia and Russia as well as Lithuanian teams. 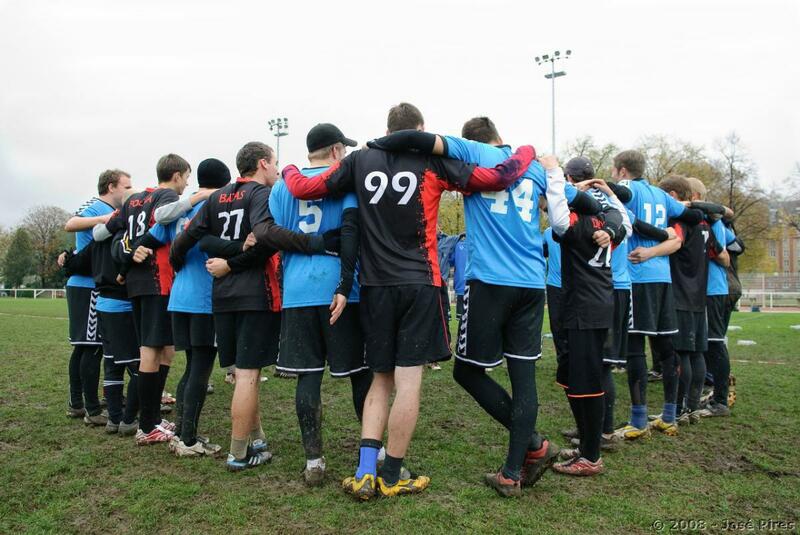 Later the same year club gained an opportunity to take part in the European Ultimate Club Championships (EUCC 2005) in Rostock, Germany. It was the strongest and biggest tournament the club had ever participated in over nearly 4 years of its existence. It was an honourable experience for the club despite them coming in 23rd out of 32 teams. After returning from Germany team finished undefeated in the second Lithuania Ultimate Championships (LUC) 2005. Year 2006 was very much so-so. Taškas didn‘t manage to achieve the goals that were set at the beginning of the year. 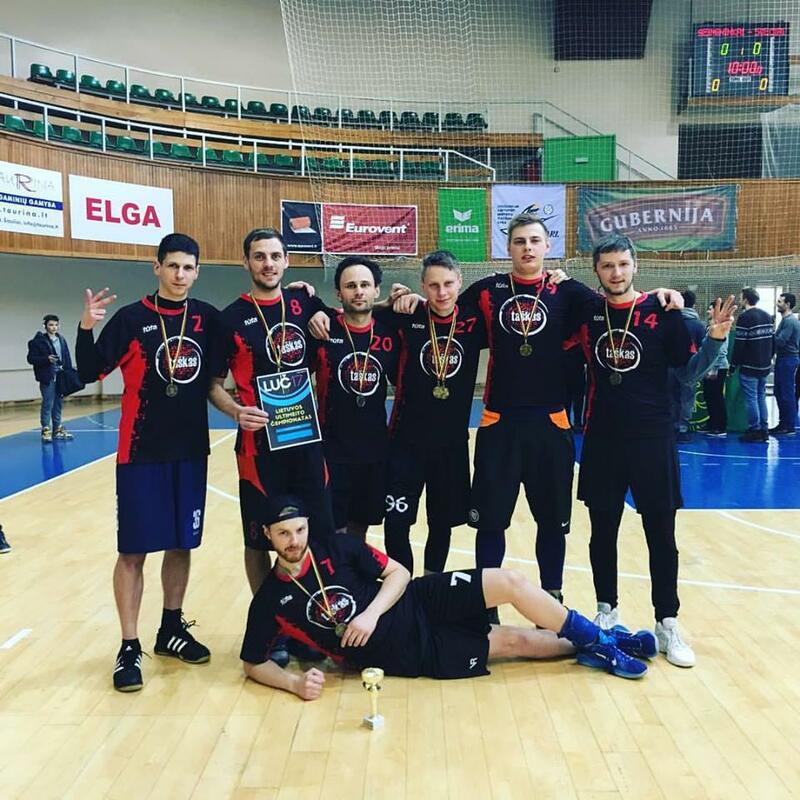 Even though it defended the LUC title and won the Zaraza tournament for the second time in a row, Taškas finished 5th in the Baltic Ultimate Championships and couldn‘t even break into the top 8 in “Rigas Rudens”. So the season didn’t end in a very good mood. 2007 didn’t quite start amazing as well. Fourth place in LUC Indoor and only fifth in “UltiFreeze” was not something everyone expected; however the upcoming outdoor season was much better. “Zaraza”, Jurmala’s “Bite” and Baltic Ultimate Championships were lost only in the finals and what’s even more exciting is that young generation of SK “Taškas” already made significant contribution to the clubs results as during the year we were struggling to get all experienced players together. 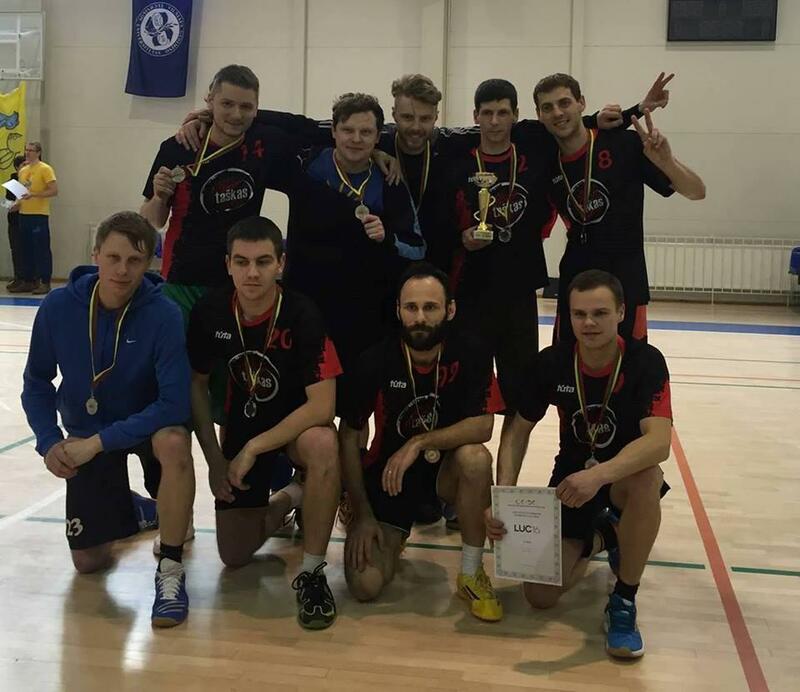 For the fourth time Lithuania Ultimate Championship title was brought back to the little town on the edge of Lithuania – Zarasai. The year 2007 was finished with an incredible performance at “Rigas Rudens 2007”. Team with only 3 subs on the side line managed to make a huge comeback in the semi-final and lose the final to the two-time winners Sokol from Moscow by only a few points. 2008 was probably the most successful in the history of the club. Both LUC Indoor and LUC Outdoor were won along with “Zaraza” and “Ultifreeze” tournaments and that is nothing to compare with some of the other opportunities the club had during the year. 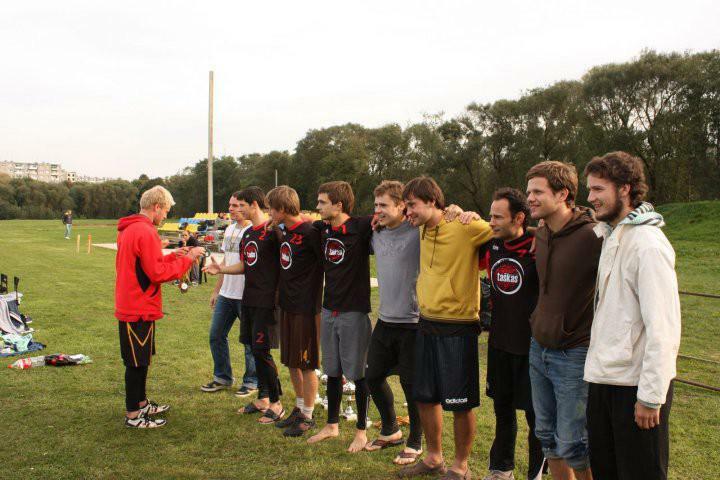 As the champions of year 2007 SK “Taškas” was awarded with a spot in the European Ultimate Championships Series of North-East region with a possibility to win a right to represent Lithuania in the European Ultimate Championship Finals in Paris, France. After a summer of preparation and training camps, “Taškas” along with a few players from “Zepps” and “UŽA” lost their final game for the 5th place by only 3 points and were left withour the right to go to EUCF. And that was where fortune came along. One of the top 5 north-east region teams baled on the EUCF and Taškas as holder of the sixth place were suggested to take part in it. Thanks to its significant history, members of SK “Taškas” are now making their contributions to the development of stronger ultimate in Lithuania and other countries. A number of players constantly play for national teams and regularly help other teams from around Lithuania and Europe. 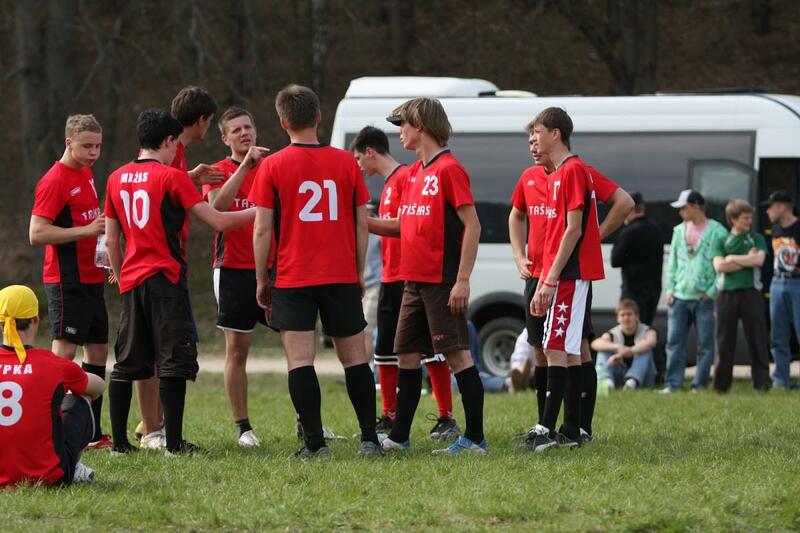 SK “Taškas” is open for all ultimate-loving people and welcomes everyone to the club. We also appreciate all the help that comes from outside the club, including players that helped us achieve what we have at the moment.